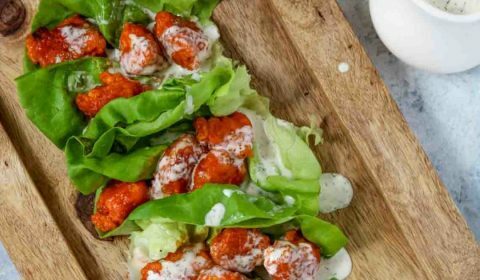 These buffalo chicken lettuce wraps are the perfect healthy alternative to one of my absolute favorite foods. 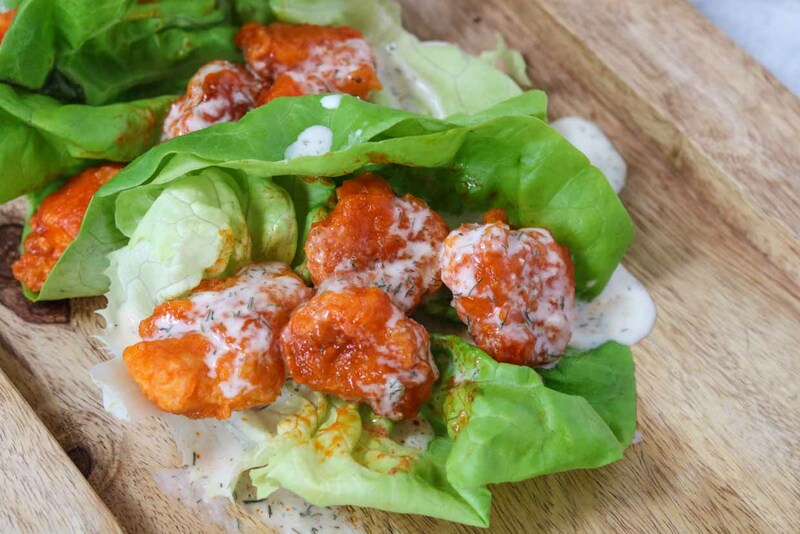 The buffalo chicken bites are gluten-free using a light Tapioca flour breading and cooked in coconut oil. You could also go the grilled chicken route for these as well, but if you want a little breaded crunch using Tapioca flour and coconut oil gives you a healthier alternative to traditional pre-breaded options. 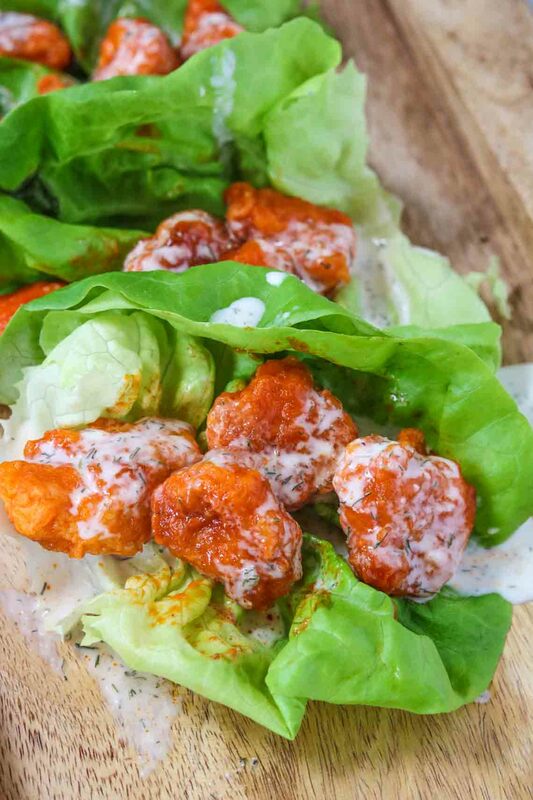 I also topped these buffalo chicken lettuce wraps with my dairy-free Paleo ranch dressing, too! If you’ve followed me for awhile you know that my family and I are buffalo addicts. We’ll be the family of 6 that all orders the buffalo wings or the buffalo chicken sandwich. This was one of THE first meals I converted to a healthier alternative when we changed up our diets. The best part is that they all love these buffalo bites so it’s a win win for everybody. These buffalo chicken lettuce wraps make the perfect lunch to take to work or on the go. I’ll make up a batch of these and use them all week long in salads or in wraps. One batch will give you a week’s worth of lunches! The dairy-free Paleo ranch is a staple dressing in our household. It’s super easy to whip up a batch and store in a mason jar. No more expensive ‘healthy’ salad dressings or dressings filled with weird ingredients or loaded with sugar. Make Paleo ranch dressing and store in the refrigerator until ready to use. Dip the chicken bites first into the egg, then tapioca flour, then place into coconut oil to cook. 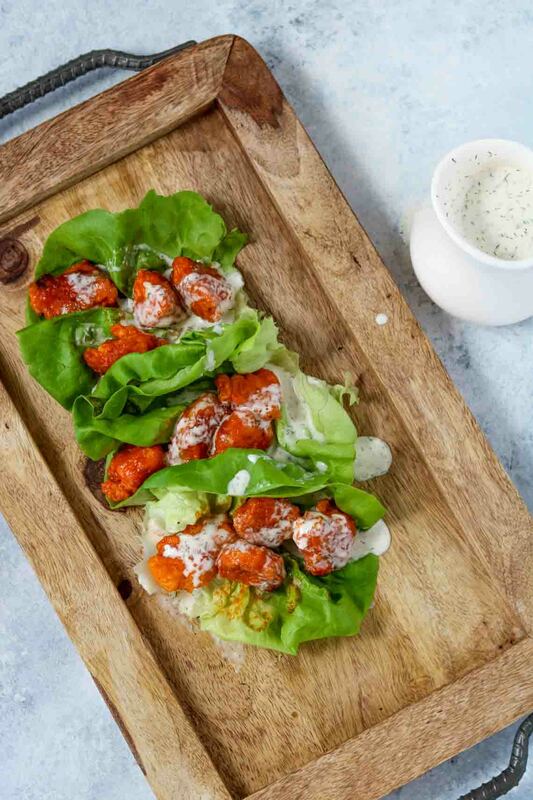 To assemble the wraps, place 3-4 buffalo chicken bites onto one butter lettuce leave, top with Paleo ranch and enjoy!